For other uses of "Qi", see Qi (disambiguation). "QI (TV series)" redirects here. For the Czech, Dutch and Swedish versions, see Qi (disambiguation) § Television. QI (Quite Interesting) is a British comedy panel game television quiz show created and co-produced by John Lloyd, and features permanent panellist Alan Davies. Stephen Fry was host of the show from its initial pilot, before departing after the final episode of the M series in 2016, with frequent QI panellist Sandi Toksvig replacing him prior to the beginning of the N series in 2016. The format of the show focuses on Davies and three other guest panellists answering questions that are extremely obscure, making it unlikely that the correct answer will be given. To compensate, the panellists are awarded points not only for the right answer, but also for interesting ones, regardless of whether they are right or even relate to the original question, while points are deducted for "answers which are not only wrong, but pathetically obvious" – typically answers that are generally believed to be true but in fact are misconceptions. These answers, referred to as "forfeits", are usually indicated by a loud klaxon and alarm bell, flashing lights, and the incorrect answer being flashed on the video screens behind the panellists. Bonus points are sometimes awarded or deducted for challenges or incorrect references, varying from show to show. QI has a philosophy that "everything is interesting if looked at in the right way"; many factual errors in the show have been corrected in later episodes or on the show's blog. For its first five series shown between 2003 and 2007, which corresponded to the first five letters of the alphabet, episodes premiered on BBC Four before receiving their first analogue airing on BBC Two a week later. From 2008 and 2011, the show was moved to BBC One, with an extended-length edition of each episode often broadcast on BBC Two a day or two after the regular show's broadcast under the title of QI XL. Series G and H saw the regular show broadcast in a pre-watershed slot with the extended edition remaining within a post-watershed slot. Beginning with the I series, the regular show returned to a post-watershed slot on BBC Two. Syndicated episodes of previous series are regularly shown on UKTV G2/Dave. The show has received very positive ratings from critics and has been nominated for multiple awards; QI itself has the highest viewing figures for any show broadcast on BBC Four and Dave. Several books, DVDs and other tie-ins to the show have been released, and international versions of QI have been made in other countries. Comedian Alan Davies has been a permanent QI panellist in every series. The panel consists of four participants: three rotating guests and one regular, Alan Davies, who has the seat to the immediate right of the host. Davies has appeared in every episode, although in "Divination" he was not able to appear at the studio but was still able to play "from beyond". [fn 1] Despite frequent wins, Davies often finishes last due to incurring forfeits. Questions posed to the panellists are often misleading, obscure, or very difficult. Providing an "obvious but wrong" answer (referred to as a "forfeit") results in a sequence of klaxons, alarm bells, and flashing lights and a score penalty. Davies is often the panellist who gives these answers. In the first two series, Fry produced the given answer on a card to show the panellists, while it also flashed on the large screens behind them (except in the pilot episode and the first show of the first series, when only the cards were used.) In the third series and onward, Fry's answer cards were dispensed with altogether, leaving only the screens as proof that such answers had been predicted. Because the show's creators expected that hardly anyone would be able to give a correct answer without significant prompting, they instead encourage sheer "interestingness", which is how points are mainly scored. As such, tangential discussions are encouraged, and panellists are apt to branch off into frivolous conversations, give voice to trains of thought, and share humorous anecdotes from their own lives. The number of points given and taken away are normally decided by Fry or beforehand by QI researchers known as "The QI Elves". For example, in one episode Davies was docked 10 points for suggesting "oxygen" to the question "What is the main ingredient of air?" Negative scores are common, and occasionally even the victor's score may be negative. Score totals are announced at the conclusion of the show. Fry has said, "I think we all agree that nobody in this universe understands QI's scoring system." John Lloyd, QI's creator, has, on one occasion, admitted that not even he has any idea how the scoring system works, but there is someone who is paid to check on the scores. According to the Series A DVD, guests are allowed the right of appeal if they believe their score is wrong, but none has so far exercised that right. Panellists are given buzzers to use in signaling a response, each of which produces a different sound when pressed. For the first three series, the sounds were seemingly random things or followed an arbitrary theme in each episode, such as commonly heard everyday sounds in the Series C episode "Common Knowledge." From Series D onwards, all four sounds are based on the particular episode's theme, such as in the Series F episode "Films and Fame" (sound clips associated with well-known movies, with Davies receiving Porky Pig's stuttering "That's all, folks!"). The buzzers are always demonstrated at the beginning of the programme, but are usually given a shortened version for repeated use during the episode, mostly in General Ignorance. Davies "always gets the most demeaning sound" for his buzzer. Sometimes, the buzzers have unique points to them, such as having questions based on them; in most cases they are usually about Davies' own, such as for example, one of his buzzer noises in the Series D episode "Descendants" sounded like a Clanger, and the panel had to try and guess what was being said, while in the Series F episode "Fakes and Frauds", all the buzzers sounded like ordinary household objects, but three turned out to be the sound of the superb lyrebird mimicking the noises. In other episodes, they were sometimes changed to suit the theme of an episode; for the Series D episode "Denial and Deprivation", the panellists had to use unique buzzers - two had bells, one flicked a ruler over the edge of a school desk, and Davies squeezed a toy chipmunk - while in the Series G episode "Green", the buzzers were replaced with whistles so the show could be eco-friendly. In a parody of ubiquitous general knowledge quizzes, the final round is off-topic and called "General Ignorance". It focuses on seemingly easy questions which have widely believed but wrong answers. Whereas in the main rounds of the show, the panellists' buzzer usage is not usually enforced, the "General Ignorance" questions are introduced by Fry's reminder to keep "fingers on buzzers". "General Ignorance" was featured in every episode until the I (ninth) series, but featured only occasionally in the J (tenth) and K (eleventh) series before appearing regularly again in the L (twelfth) series. Due to the large number of "obvious but wrong" answers, panellists—especially Davies—usually incur the greatest point losses in this round. In a number of episodes, either the set, the panellists' clothing, the opening theme, or a mixture of all, are changed to match the episode's theme. For example, in "Denial and Deprivation", the set was replaced with an auctioneer stand for Fry and school desks or side tables for the panellists, and the lighting was stripped down; while in "Health and Safety", the panellists wore hard hats, safety glasses, and bright yellow work vests and Fry wore a doctor's white coat and stethoscope. In some episodes, an extra task is given to the panellists to complete during the course of an episode, which can earn them extra points. Such tasks have included a drawing contest, or spotting an item on the video screens and waving a "joker" card (e.g. Cuttlefish.) Several series have had a recurring task spanning every episode, often involving the use of a joker card to respond to a question whose answer fit a specified theme. Examples include "The Elephant in the Room" (series E, elephants), "Nobody Knows" (Series I, for questions without a known answer) and "Spend a Penny" (Series L, lavatories). In addition to assigning tasks, Fry performed scientific experiments or demonstrations during certain episodes. He often did so once an episode in the J, K and L series, where they were called "Jolly Japes", "Knick-Knakes" and "Lab Larks", respectively, and usually occurred towards the end of the episode. Such experiments either used simple objects, various chemical compounds, odd contraptions, or a mixture of all. If an experiment's outcome was too fast to be seen, a short "replay" of it was shown, (sometimes with multiple angles) to reveal precisely what happened. Veteran comedy producer John Lloyd was the driving force behind QI's creation. 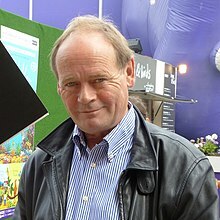 Writer and former BBC producer John Lloyd devised the format of the show, and it is produced by Quite Interesting Limited, an organisation set up by Lloyd. QI was originally seen as being an "Annotated Encyclopædia Britannica ... the world's first non-boring encyclopaedia." As a panel game, it was conceived as a radio show, with Lloyd as chairman. While developing the show with Peter Fincham and Alan Yentob, Lloyd decided that it would work better on television. The three pitched it to Lorraine Heggessey, controller of BBC One at the time. Heggessey passed on the format, opting to commission a similar panel game called Class War (which was never made.) When Fincham became controller of BBC One, Lloyd pitched it to him, only to be turned down by his former collaborator. Eventually, he pitched it to Jane Root, then controller of BBC Two, who agreed to develop it. When it was decided that the show would air on television, Michael Palin was offered the job of chairman with Fry and Davies as captains of the "cleverclogs" and "dunderheads" teams, respectively. However, when Palin decided not to take the job, the producers opted to change the format; Fry became the host, with Davies as the only regular panellist. Root commissioned a pilot and a further 16 episodes after that, although budget limitations reduced the first series to 12 episodes. In October 2015, it was announced that Fry would be stepping down as host after Series M and would be replaced by Sandi Toksvig. Fry described his position on QI as "one of the best jobs on television", but that "it was time to move on". Toksvig said that "QI is my favourite television programme both to watch and to be on". Lloyd said that Toksvig will be "the first female host of a mainstream comedy panel show on British television", and that although she is very different to Fry, she "will bring to the show the same kind of wonderful thing that Stephen does, the mixture of real brains and a hinterland of knowledge, plus this naughty sense of humour." He also said it will give the show a chance to "do things in a slightly different way". Stephen Fry was the QI Master from the pilot through to Series M in 2015. Danish-born Sandi Toksvig, a regular QI guest (Bantermeister), took over from Fry as QI Master from Series N in 2016. 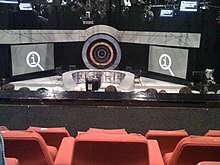 The QI panel set, seen empty in 2009, incorporates the QI logo. Recordings usually take place over a few weeks in May or June at The London Studios; three episodes are typically filmed per week and sixteen are filmed for each series. In the morning on the day of recording, the studio has to be set up. Seven cameras are used to record QI. To check images, forfeits, buzzers and lighting are working, the first technical rehearsal is hosted by floor manager Guy Smart with stand-ins for panellists. Fry, who was given the list of questions roughly an hour beforehand, hosted the second technical rehearsal at 2:00 pm. Guests may have time to practise with a set of warm-up questions. For earlier series, warm-up comedians were used before recording began, frequently Stephen Grant, credited as the "audience wrangler". However, there have been no warm-ups for recent series. Fry recorded and tweeted audience AudioBooms and introduced the guests before the show. Recordings start at either 4:30 pm or 7:30 pm and last up to two hours, although only 30 minutes of footage is used for normal episodes and 45 minutes for "XL" episodes. By 10:00 pm, recording has usually finished and the set has been disassembled. Roughly 16 questions are asked and about half of those make it into the show; 20% of material researched is used in a QI episode, while other facts may appear in the XL versions, a QI book, on QI's Twitter feed or on their website. The makers of the show insist that the answers are not given to the panellists beforehand. The host is given a list of questions about an hour before the show, for preparatory purposes, but the guests are forbidden to ask for preparatory materials or other help. Alan Davies never does any preparation. In an interview with the Radio Times regarding the current state of the BBC, Fry revealed one of the regular panellists insists on seeing the questions before they appear in the show. "There's only one regular guest who always insists on seeing the questions beforehand and prepares for them. I won't tell you his or her name," he said. "It really annoys me. In fact, one day, I'll make sure that person is given a list from another programme because they don't need them." Following this comment people asked Fry to come out and say who it was, with several people posting their suggestions as to who it was. Fry later posted on his Twitter account that it was neither Davies nor Rob Brydon. The research for the show is mostly carried out by seven people called the "QI Elves", a team which has included Justin Pollard, Vitali Vitaliev, and Molly Oldfield (daughter of Mike Oldfield). The "elves" devise the questions for the show, and one is on set during filming who is able to communicate with the host during the show to provide and correct information. Other people involved in researching questions and compiling the scripts are John Mitchinson and Piers Fletcher, known (along with Justin Pollard, Molly Oldfield, and James Harkin) as the Question Wranglers, whose research uses both Encyclopædia Britannica and Wikipedia. The QI website also has a forum. A QI Elves podcast, "No Such Thing As A Fish" began on 8 March 2014. The title is taken from an entry into the "Oxford Dictionary of Underwater Life", which was used on the show. The audio from the first episode in which they discuss how they found this fact is used as an introduction. Regular elves are Anna Ptaszynski, James Harkin, Dan Schreiber, and Andrew Hunter Murray, with occasional appearances from Alex Bell and Anne Miller. Dan is the host of the show. The theme song is "Wasps" from the band Emperor Yes, which is based on a fact about bees which was used on QI. The song is written as an exchange between the bees, as they defend their hive from attacking wasps by swarming the wasp, and using their body heat to boil the wasps. Points may be given to (or taken from) the audience, and five episodes have the distinction of being won by the audience: "Death", the 5th episode in Series D; "England", the 10th episode in Series E; "Flora & Fauna", the 10th episode in Series F; "Greeks", the 14th episode in Series G; and "Next", the 15th episode in Series N. The audience's win in "Greeks" was only announced during the XL broadcast as their contribution was cut out of the main broadcast. In contrast, the audience lost the 5th episode of Series E, "Europe", receiving a forfeit of -100 when they incorrectly sang the first stanza of the German national anthem. A special stand-alone episode was filmed between 1:00 and 2:00 am (GMT) on 6 March 2011 as part of Comic Relief's special 24 Hour Panel People featuring David Walliams, who appeared in various old and new panel game shows throughout a 24-hour period. The shows were streamed live on the Red Nose Day website, and parts of each show were shown during five half-hour specials on Comic Relief. The QI episode featured panellists Sue Perkins, Jo Brand, Russell Tovey and David Walliams. Davies admitted through Twitter that he was asked to host the episode when it was not certain if Fry would be available, but Davies declined. Once Fry confirmed his participation, Davies did not hear back from the production team. Unlike the classic format of the show where most questions follow a subject, this episode was instead an hour-long (including breaks) General Ignorance round. The following have all appeared multiple times as one of the guest panellists on the show, including any as-yet unbroadcast episodes of Series P. This list only includes "canonical" episodes of the BBC show. It does not include the unbroadcast pilot, nor the special editions for the Comic Relief and Sport Relief telethons, nor any live stage editions. Jimmy Carr and Phill Jupitus are the only remaining guests to have appeared in every series to date. Rich Hall has the highest number of guest appearances in a single series—six times in Series B (half of the episodes that year)—as well as the highest number of wins by a guest panellist, with 10. 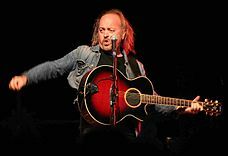 Musical comedian and actor Bill Bailey has appeared on 42 episodes as well as the pilot. 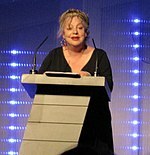 Comedian and actor Jo Brand has appeared on 37 episodes. 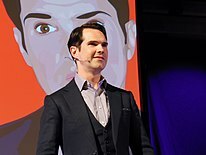 Comedian Jimmy Carr is one of two guest panellists to appear in every series. Former Never Mind the Buzzcocks captain and comedian Phill Jupitus has also appeared in every series. 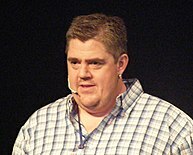 Bailey, Brand, Carr and Jupitus are the only guest panellists to have made 37 or more appearances. a. 1 Also made an additional appearance in the unbroadcast pilot. b. 1 2 Also made an additional appearance in the live Comic Relief episode. c. 1 2 3 Also made an additional appearance in the live Sport Relief episode. d. 1 Excluding Series N onwards. Toksvig took over hosting duties from Fry from the start of Series N.
As of 2011, QI is distributed by FremantleMedia. In Australia, QI is broadcast on the ABC. The programme was first broadcast on 20 October 2009 after the surprise ratings success of Stephen Fry in America. The ABC aired QI Series F first, but subsequently, in July 2010, ABC1 began broadcasting QI from the very beginning with Series A. The show was regularly repeated and screened every day at 6:30 pm at one point. In 2013, the ABC was criticised in Federal Parliament for showing QI repeats and other shows featuring Stephen Fry too frequently, so much so that at a parliamentary enquiry one speaker asked "how viewers would know they were actually in Australia" and not Britain. QI has also been broadcast on the pay TV channel UKTV. In March 2010, QI began a run in New Zealand on Prime. On 27 May 2011, Series A of QI was broadcast in South Africa on BBC Entertainment. QI series A-J has also aired on BBC Entertainment in the Nordic countries. There have been several attempts to broadcast QI in the United States. US networks that have tried to broadcast the series include Comedy Central, PBS, Discovery Channel and BBC America. Show creator and producer John Lloyd said that one factor in the failure to get the show broadcast is due to the cost. As QI features several images during each episode there are copyright issues. Lloyd said in an interview with TV Squad that: "No country in the world has bought the original show and this is partly a matter of cost. The pictures in the background of the show are only cleared for UK usage, so until the show is bought by a Stateside TV company and the rights cleared for World, the programme (is) unaffordable by smaller countries." Amongst the famous names also to express anger over QI not being shown in the US include comedian John Hodgman, who appeared as a "fifth guest" in the second episode of Series G. In 2013, QI was picked up in the US by the streaming video service Hulu. On 30 January 2015 BBC America announced that they had acquired QI and planned on airing the show, beginning with Series J, on 19 February 2015. Davies has criticised QI being repeated so often, saying "QI being in a soup of shows on one of these repeat channels ... completely devalues the brand". Davies thought the show would gain more viewers when a new series aired if channels "[made] an audience wait for a couple of months". In 2008, the QI format was sold to the Dutch broadcaster VARA. Also called QI, the Dutch version of the show aired for the first time on 27 December and was hosted by the writer Arthur Japin with the comedian Thomas van Luyn taking the role of regular panellist. Japin also appeared (in the audience) in a British QI episode, "Gothic", explaining how the name Vincent van Gogh should be pronounced. The Dutch series was discontinued after six episodes. A Swedish version of QI started airing on SVT1 8 September 2012, and is called Intresseklubben. Comedian Johan Wester hosts Intresseklubben, and Anders Jansson is featured as the regular panellist. A second series covering the letter B started airing in September 2013; Series C was recorded in June 2014 and aired in late 2014, while season D was recorded in June 2015 and started airing in August 2015. A Danish version of QI, called Quiz i en hornlygte aired on DR2 between 2012 and 2013. The show was hosted by Danish comedian Carsten Eskelund. While not directly branded as a Danish version of QI, it maintained some recognizable elements, such as the difficulty of some questions and awarding points for interesting answers as well as negative points for wrong, but widely believed, answers. The Czech version of QI was first broadcast on TV Prima on 14 August 2013. The programme is hosted by Leoš Mareš, with Patrik Hezucký appearing as a guest in every episode. Some of the answers on the show have been disputed and shown to be incorrect. For example, in Series A, the show claimed that the longest animal in the world was the lion's mane jellyfish, but this was later corrected in Series C, saying that the longest animal in the world is the bootlace worm. The fart-in-the-bath story was trotted out last year in an episode of Stephen Fry's otherwise admirable quiz show QI. It (the story) first appeared some twenty years ago in a newspaper article, to which my father immediately wrote a rebuttal. This was obviously ferreted out by some BBC researcher. It may be quite interesting, but in this case, it just isn't true. At the end of the third series, Dara Ó Briain was docked points for having stated, in the previous series, that the triple point of water is zero degrees Celsius, an answer which earned him 2 points at the time. Viewers had written in to say that the triple point of water is in fact 0.01 degrees, and so the 2 points awarded Ó Briain in the previous series were revoked and he received a further deduction of 10 points for "saying a now obvious answer". Various other retractions are made by the producers of the show on the special features of the DVD releases. The origin of the error may also be explained. (Information contributed by a panellist during a discussion, but which has since been found to be false, is also corrected here.) For instance, Fry made a mistake when explaining why helium makes your voice higher, in the Series B Christmas special. He claimed that the gas only affected the frequency, but not the pitch, despite them being the same thing; in actuality, the timbre is affected. The "Knowledge" episode in Series K included point refunds for the three panellists who had appeared previously; it was explained that many facts on the show are later shown to be incorrect. The largest refund went to Davies, who received in excess of seven hundred wrongly deducted points. Fry gave some examples of incorrect facts told in previous episodes, such as ones relating to lobster ages, the evolution of giraffe's necks and millipede legs. More recently, the online forum now includes a "QI Qibbles" blog, which aims to rectify further mistakes in the series. "We live, they say, in The Information Age, yet almost none of the information we think we possess is true. Eskimos do not rub noses. The rickshaw was invented by an American. Joan of Arc was not French. Lenin was not Russian. The world is not solid, it is made of empty space and energy, and neither haggis, whisky, porridge, clan tartans or kilts are Scottish. So we stand, silent, on a peak in Darien a vast, rolling, teeming, untrodden territory before us. QI country. Whatever is interesting we are interested in. Whatever is not interesting, we are even more interested in. Everything is interesting if looked at in the right way. At one extreme, QI is serious, intensely scientific, deeply mystical; at the other it is hilarious, silly and frothy enough to please the most indolent couch-potato." On 28 December 2009, the BBC Radio 4 panel game The Unbelievable Truth, hosted by frequent QI guest panellist David Mitchell, broadcast a New Year's Special which paid tribute to QI. The show featured Fry, Davies and Lloyd on the panel, as well as Rob Brydon, another regular QI participant. In December 2010, panellists on QI made jokes during a discussion about Tsutomu Yamaguchi, who survived both atomic bombings of Hiroshima and Nagasaki in August 1945. Yamaguchi had died only earlier that year. The Japanese embassy in London wrote a letter of complaint to the BBC about the content of its quiz show after being alerted to the content when viewers in Japan contacted diplomatic staff. Yamaguchi's daughter also made known how upset she was as a result of the comments broadcast on the BBC. She said that Britain, as a nuclear power, had no right to "look down" on her father. In January 2011, the BBC issued an apology for "any offence caused" to Japan by the incident, recognising "the sensitivity of the subject matter for Japanese viewers". In February 2011, the BBC blamed a "strength of feeling" in Japan following its atomic bomb joke broadcast for the cancellation of the filming of part of its Planet Word documentary in Japan, which was due to be presented by Fry. In February 2011, the BBC received several complaints about jokes made in an episode of QI about Margaret Thatcher. Regular panellist Jo Brand commented that Lady Thatcher sounded like "a device for removing pubic hair". Later, panellist Phill Jupitus shouted "Burn the witch!" when a digitally altered picture of Thatcher, showcasing the Thatcher effect optical illusion, was shown on-screen. Several Conservative politicians condemned the remarks; and Lord Tebbit complained that "Lady Thatcher has been treated like this by the BBC for the past 30 years". A spokesperson for the BBC said that the episode was filmed in June 2010 and had no relation to current events. In 2011, an episode of QI featuring Jeremy Clarkson was withdrawn due to controversial comments Clarkson had recently made about people committing suicide by jumping in front of trains. The QI episode did not contain any such statements, but was postponed "to avoid putting Clarkson in the spotlight". The episode, on the subject of "idleness", was broadcast later. On 11 January 2013, an episode of QI ending with Fry reading a limerick about paedophilia was criticised by viewers, especially as it was broadcast directly before a Newsnight report on Jimmy Savile. The BBC Trust described the incident as "unfortunate and regrettable" and the limerick as "capable of causing offence", but ruled it was not in breach of BBC guidelines. Number of female panellists in the first 170 episodes of QI. The BBC has received criticism regarding the lack of women on their comedy panel shows. As a result, the corporation decided to ban all-male panels on comedy shows in February 2014, with BBC's director of TV Danny Cohen stating in an interview with The Observer that "shows without women are unacceptable". In November 2014, Mirror reported stats revealing that 38% of all QI episodes at that time had featured only men, 55.9% featured only one woman, and only the remaining 6.1% had two or three women, out of a total of three guest panellists per episode (the fourth one being regular panellist Alan Davies). Clem Bastow of The Sydney Morning Herald was supportive of BBC's decision, saying that "left to their own devices, the producers of these shows are clearly failing massively when it comes to putting together line-ups that aren't just endless parades of the same old white men," and noted that this could motivate the producers to uncover some new talent. In 2017, creator of QI John Lloyd commented on BBC's decision, telling the Cheltenham Literature Festival that "arguing a BBC quota for women panellists risked being mere tokenism", while his wife Sarah Wallace—director of QI Limited—stated that female comedians are hesitant to appear on the show. In April 2014, Sandi Toksvig, who was hosting The News Quiz on BBC Radio 4 at that time, had also criticised BBC's decision saying that "recruiting more female hosts would be a more desirable way of correcting the imbalance." She explained that women would feel more comfortable about participating with a female host, and described the fact that many quiz shows are presented by men as "slightly ridiculous". In 2015, when Toksvig took over from Fry as a host of QI, she told the Guardian newspaper: "If I can show that by hosting a programme like this women neither destroy the social fabric of this country or frighten the horses, it's a very good job." Nevertheless, Toksvig has acknowledged Fry's delicate treatment towards his female panellists, and she herself continues to encourage them to be smart and funny when they appear on the show. In 2018, Emma Cox of Radio Times highlighted a notable difference between QI and other "aggressively masculine" panel shows that marginalise women. In September 2018, while responding to a question on equal pay at the Women's Equality Party's conference, Toksvig revealed that she receives 40% of what Stephen Fry was being paid as the host of QI, which is the same amount as Alan Davies. Talent fees for QI are managed by Talkback. You feel like you're at the pub with the funny, clever people, ear-wigging on their slightly tipsy meanderings, rather than standing against a wall while they fire their joke cannons at you. It draws you in, all that familiarity and casual pontification. QI was received very positively by its viewers. It was the most popular programme on BBC Four in 2005, and one of its books, The Book of General Ignorance, became a global bestseller for Christmas 2006. QI has been supported by nearly all critics. Peter Chapman said, "When the schedules seem so dumbed-down, it's a delight to encounter the brainy and articulate Stephen Fry. He excels in this format, being both scathing and generous." Another critic, Laura Barton said, "QI and its canny coupling of Stephen Fry and Alan Davies, which manages to condense tweedy goodness, cockney charm, pub trivia and class war into one half-hour." Julia Raeside from The Guardian reviewed the show during its tenth series, calling it "still rather more than quite interesting" and complimenting it for being "one of the last truly popular programmes on mainstream television where comedians are allowed to be clever". Raeside noted ratings were still high, as four million viewers in total watched the first J series episode of QI and QI XL. American critic Liesl Schillinger described QI as "Jeopardy! with Stephen Colbert as host, with Steve Martin and Ellen DeGeneres as guests, working off a game board loaded with unanswerable questions." Matt Smith gave QI Live a positive review, calling it "funny, educational, and ... quite interesting"; Smith noted there was a "great deal of Fry worship" and that, due to high ticket prices, "only the most dedicated Fry fans ... would come to this show". He commented that "much like the television show, your enjoyment of the stage version will be affected by how you perceive the guests", but went on to say that he enjoyed the line-up in the show he saw. QI has entered a number of different media, and has seen an increasing number of tie-in DVDs, books and newspaper columns released since 2005. The first QI book was 2006's The Book of General Ignorance, published in hardback on 5 October by Faber and Faber. (ISBN 9780571233687) Written by producer and series-creator John Lloyd and QI's head of research, John Mitchinson, it includes a foreword by Fry and "Four words" by Davies ("Will this do, Stephen?".) Most of the book's facts and clarifications have appeared on the programme, including its list of 200 popular misconceptions, many of which featured during the "General Ignorance" rounds. On 8 December 2006, the book "became a surprise bestseller over the Christmas period, becoming Amazon's number one Global bestseller for Christmas 2006." By the end of January 2007, it had sold more than 300,000 copies (and subsequently over half a million), paving the way for subsequent (projected) annual book releases to capitalise on the UK Christmas book market. The Official QI website notes that it will soon be published in 23 countries. Pocket-sized and audio versions of General Ignorance went on sale the following year. In 2008, a newly revised version was published under the title of The Book of General Ignorance: The Noticeably Stouter Edition. This edition corrected and updated some of the information from the first print, while adding 50 new sections (and extra illustrations) to the original 230. It also included quotes from the series, new "Four Words" by Davies and added a complete episode listing from Series A–F, along with an index. QI's second book, The Book of Animal Ignorance, was released in the UK (in the same hardback format) by Faber & Faber on 4 October 2007. (ISBN 978-0-571-23370-0) It promised to be a "bestiary for the 21st century," and contains almost completely new quite interesting facts. The book includes "400 diagrams and cartoons by the brilliant Ted Dewan", another Foreword by Stephen Fry and a "Forepaw" by Alan Davies. This publication has also been followed by a pocket-sized version. On the Factoids feature of the Series A DVD, John Lloyd mentioned an idea he'd had for a QI book of quotations, under the working title Quote Interesting. This book was eventually published in 2008 as Advanced Banter. Similarly, on the Banter feature of the Series B DVD, Lloyd also previewed the title of QI's fourth book, The QI Book of the Dead, which went on sale on 15 October 2009. 7 October 2010 saw the publication of QI's fifth book—The Second Book of General Ignorance. Written by the same authors, this book covers a whole new series of questions on a wide variety of topics, which promises to prove that "everything you think you know is (still) wrong". The sixth QI book, 1,227 QI Facts To Blow Your Socks Off, a list of facts, was published on 1 November 2012. James Harkin, QI's chief researcher, co-wrote the book with Lloyd and Mitchinson. QI's first annual, The QI "E" Annual or The QI Annual 2008 was published by Faber and Faber on 1 November 2007, to coincide with the initial airing of the TV show's E series (ISBN 978-0-571-23779-1.) Succeeding years have seen the publication of F, G and H annuals, concurrent with the BBC show's chronology, though retrospective annuals on the first four letters of the alphabet have yet to be published. The covers, which feature various cartoon scenes starring caricatures of Fry and regular QI panellists, are produced by David Stoten (one of Roger Law's Spitting Image team), who also contributed to the annuals' contents. Many of said cover stars are also credited with contributing content to the annuals, which also provide a showcase for Rowan Atkinson's talents as a 'rubber-faced' comic, as well as the comic stylings of Newman and Husband from Private Eye, Viz's Chris Donald, Geoff Dunbar, Ted Dewan and The Daily Telegraph's Matt Pritchett. A French edition entitled Les autruches ne mettent pas la tête dans le sable : 200 bonnes raisons de renoncer à nos certitudes ("Ostriches don't put their heads in the sand: 200 good reasons to give up our convictions") was published by Dunod on 3 October 2007. (ISBN 978-2-100-51732-9) It is released as part of Dunod's "Cult.Science"/"Oh, les Sciences !" series, which also includes titles by Robert L. Wolke, Ian Stewart and Raymond Smullyan. A number of DVDs related to QI have also been released, including interactive quizzes, and complete series releases. On 14 November 2005 an interactive QI DVD game, called QI: A Quite Interesting Game, was released by Warner Home Video. A second interactive game, QI: Strictly Come Duncing followed on the 26 November 2007, from Warner's Music division. Both games feature Fry asking questions, and then explaining the answers in full QI-mode. A DVD release for the first series was the direct result of an internet petition signed by 1,821 people, which persuaded the BBC of the interest in such a move. Series A, was therefore released by BBC Worldwide's DVD venture, 2 entertain Ltd. on 6 November 2006 (as "QI: The Complete First Series.") It contains a number of outtakes as well as the unbroadcast pilot. Sales over the Christmas period, however (in stark contrast to The Book of General Ignorance, which topped the Amazon.co.uk best-seller list), were not as strong as hoped. A lack of adequate advertising is thought to be to blame (and subsequent episodes of QI have since trailed the DVD), and may have factored in the label change for Series B. Series B was released on 17 March 2008, followed by Series C on 1 September. In 2014 a message on the QI site read "Due to a number of copyright issues there are difficulties releasing further series of QI on DVD". On 14 December 2015 Network Distributing a video publishing company made an announcement on its website that it had made a deal with FremantleMedia so previously unreleased shows could be made available on DVD sometime in 2016; among the list was QI. The DVD sets, released on 8 May 2017, were split into two initial volumes of series A-D and E-G, containing additional features including a 'Making of' feature, interviews and bloopers. Two additional sets, series H-J and K-M are scheduled for release on 23 October 2017. A box set of series 1–3 (Series A-C) was released in September 2011. Additionally, a single DVD titled "The Best Bits" containing clips from Series G was released 3 June 2010. Two years later a three DVD set labelled as "Series 9" was released in August 2012, containing the Series H episodes. The Series 9 DVD title was later changed to "The H Series" and The Series J was released also on 5 March 2014. ^ This DVD was originally released as "Series 9" but later had its name changed to "The H Series". Series J–M are available in HD on Netflix but can only be streamed in the United Kingdom and Ireland. Series N was available through the BBC Store but no longer due to the store's closure in 2017. Series L–N are available on Amazon Video but can only be streamed in the United Kingdom and Ireland. Additionally UKTV Play also offers a number of episodes that have been repeated on Dave on its on-demand service. Series A through G are available on Acorn TV and Series I, J and K are available on Hulu but can only be streamed in the United States. Since 10 February 2007, a weekly QI column has run in The Daily Telegraph newspaper. Fifty-two columns were planned, originally alphabetically themed like the TV series and running from A to Z twice, but the feature is ongoing and was recently re-launched in the newspaper's Saturday magazine and online. A QI feature has appeared in BBC MindGames magazine since its fifth issue, and revolves around facts and questions in the General Ignorance-mould. There is also a weekly QI linked multiple choice question featured in the Radio Times, with the solution printed in the feedback section. QI also has an official website, QI.com, which features facts, forums and other information. It also links to QI's internet show QI News, a parody news show which broadcasts "News" items about things which are "quite interesting". QI News stars Glenn Wrage and Katherine Jakeways as the newsreaders, Bob Squire and Sophie Langton. On 22 December 2010, Faber and Faber released a QI App. Amongst the features of the App are a library containing the complete contents of The Book of General Ignorance, The Book of Animal Ignorance and The QI Book of the Dead, arranged as 56 "themed book" on a customisable scrollable shelf. There is also a rolling selection of quotes from Advanced Banter. The App also allows users send interesting information to the QI elves in the form of "postcards" and can be rated on the "Interestingometer". The top 10 most popular facts every week are listed on the QI website. The QI Test was a planned spin-off version of QI that was to be broadcast on BBC Two. Created by Lloyd, Talkback Thames' Dave Morely and former QI Commercial Director Justin Gayner, The QI Test differed from QI in that it would have featured members of the public as contestants instead of comedians and celebrities. It would have been broadcast during the daytime schedules. The pilot was not hosted by Fry and was recorded in November 2009, but a series has yet to be broadcast. ^ Alan Davies was absent for the recording of this episode, as he did not want to miss his favourite football team, Arsenal, playing in the Champions League final that same evening. He did however make an appearance through pre-recorded material, which ended with him being 'teleported' to the match as he tested his buzzer. ^ a b "Brand: QI". FremantleMedia Enterprises. Archived from the original on 25 April 2012. Retrieved 31 October 2011. ^ "Stephen Fry to Step Down after Series M". BBC News. Retrieved 14 October 2015. ^ "Atoms". QI. Season A. 2 October 2003. ^ a b QI.com, "Philosophy". Archived 3 April 2008 at the Wayback Machine Retrieved 15 June 2007. ^ "QI moves to BBC One". 2 October 2008. Retrieved 2 October 2008. ^ QI.com Archived 7 February 2012 at the Wayback Machine Audience figures. Retrieved 21 June 2007. ^ Armstrong, Stephen (17 December 2007). "Have you got your daily male?". London: The Guardian. Retrieved 17 December 2007. ^ Wolf, Ian. "QI - A Quite Interesting Guide - British Comedy Guide". British Comedy Guide. Retrieved 6 October 2018. ^ a b Myall, Steve (19 January 2013). "Quite Interesting: 50 amazing facts to celebrate 10 years of QI". Daily Mirror. Retrieved 4 January 2015. ^ "Series A, Episode 1". QI. Season A. Episode 1. 11 September 2003. ^ "Series A, Episode 4". QI. Season A. Episode 4. 2 October 2003. ^ "International". QI. Season I. Episode 2. 16 September 2011. Event occurs at 2:30. ^ a b c Raeside, Julia (28 September 2012). "QI: after 10 series still rather more than quite interesting". The Guardian. Retrieved 7 February 2015. ^ Guide, British Comedy. "QI Series D, Episode 11 - Denial And Deprivation - British Comedy Guide". British Comedy Guide. ^ Guide, British Comedy. "QI Series H, Episode 10 - Health And Safety - British Comedy Guide". British Comedy Guide. ^ Guide, British Comedy. "QI Series C, Episode 7 - Constellations - British Comedy Guide". British Comedy Guide. ^ a b c Chortle.co.uk "Last among eQIals" Written 21 December 2006. Retrieved 21 June 2007. ^ a b Lloyd, John (20 August 2008.) "QI creator says BBC1 is 'our natural home'", Broadcast Now, EMAP. Retrieved 20 August 2008. ^ a b "Stephen Fry steps down as QI host". BBC News. BBC. Retrieved 5 May 2016. ^ Furness, Hannah (14 October 2015). "Sandi Toksvig to host QI after Stephen Fry quits". The Telegraph. Retrieved 14 October 2015. ^ McGrath, Rachel (14 October 2015). "Stephen Fry Steps Down From 'QI', Sandi Toksvig Announced As Replacement". Huffington Post. ^ Hooton, Christopher (14 October 2015). "Stephen Fry quits QI: Sandi Toksvig to take over as host on BBC2 show". The Independent. ^ Plunkett, John (14 October 2015). "Sandi Toksvig will bring 'naughty sense of humour' to QI, says show's creator". The Guardian. ^ a b c d e "Recording The Show". Quite Interesting Limited. Archived from the original on 4 January 2015. Retrieved 4 January 2015. ^ a b Bell, Alex (3 October 2014). "QI: A day in the life of a QI Elf". BBC. Retrieved 4 January 2015. ^ Hawkins, Si (January 2011). "Circuit Training 28: Stephen Grant". British Comedy Guide. Retrieved 4 January 2015. ^ QI.com QI: The BBC Television Series. Retrieved 27 July 2007. ^ Mair, Eddie (7 September 2010). "Your perfect dinner date". Radio Times. pp. 10–14. ^ "Stephen Fry: BBC 'culture of fear' creating blandness". BBC. 7 September 2010. Retrieved 10 September 2010. ^ Nissim, Mayer (7 September 2010). "Fry: 'Davies, Brydon don't get QI help'". Digital Spy. Retrieved 10 September 2010. ^ a b c "The QI Elves". QI.com. Archived from the original on 25 March 2008. Retrieved 17 January 2007. ^ Whittell, Giles (3 November 2007). "Thinking buddies". London: The Times. Retrieved 3 November 2007. ^ "QI Talk Forum - Index". old.qi.com. ^ "QI : Quite Interesting". qi.com. ^ "QI : Quite Interesting". qi.com. Archived from the original on 4 September 2018. Retrieved 24 December 2018. ^ "Comedy — QI". BBC. Retrieved 22 September 2007. ^ Davies, Alan (5 March 2011). "I'm not doing this QI thing tonight. I was told Stephen couldn't do it. They asked me to host in his place. I declined. Heard nothing since". ^ "BBC - Press Office - Stars line up for Comic Relief's 24 Hour Panel People". www.bbc.co.uk. ^ Williams, Garry (11 July 2010). "3 Must See". TV Extra. Sunday Herald Sun. p. 3. ^ Knox, David (6 October 2009). "Airdate: Q.I." tvtonight.com.au. Retrieved 6 October 2009. ^ Shears, Richard (4 February 2013). "Why folks Down Under are fed up with Fry: The TV presenter's show QI is on so frequently there are fears he is killing off local talent". Daily Mail. Retrieved 26 December 2014. ^ UKTV (Australia and New Zealand) (7 December 2009). "Next Monday at 8:30pm its ..." Twitter. Retrieved 8 February 2010. ^ "2010 TV highlights". New Zealand Listener. 21–27 November 2009. Archived from the original on 2 December 2009. Retrieved 29 November 2009. ^ "Test your knowledge on BBC Entertainment's QI". Media Update. 16 May 2011. Retrieved 16 May 2011. ^ "QI - BBC Entertainment". BBC Nordic. Retrieved 8 September 2013. ^ Gallagher, Danny (11 August 2009). "Executive producer John Lloyd explains BBC's import impasse of QI". TV Squad. Retrieved 11 August 2009. ^ Gallagher, Danny (8 August 2009). "Hodgman activates rage gland against BBC America for not picking up QI". TV Squad. Retrieved 11 August 2009. ^ Ostapkovich, John (21 September 2013). ""QI" Now On Hulu And Its Creators Release A Trivia Book". CBS Philadelphia. Retrieved 9 December 2013. ^ Fletcher, Alex (2 April 2010). "Alan Davies: 'I hate QI repeats'". Digital Spy. Retrieved 26 December 2014. ^ "QI goes Dutch". Chortle.co.uk. Retrieved 19 December 2008. ^ "Humorstjärnor klara för Intresseklubben" (in Swedish). SVT Humor. Archived from the original on 5 September 2012. Retrieved 19 August 2012. ^ "Nu startar säsong B av Intresseklubben" (in Swedish). SVT Humor. Retrieved 8 September 2013. ^ "Intresseklubben är tillbaka i höst" (in Swedish). SVT.se. Archived from the original on 10 March 2014. Retrieved 2014-03-11. ^ "Quiz i en hornlygte | OM DR | DR" (in Danish). Danmarks Radio. 15 March 2012. Retrieved 9 October 2018. ^ "VyVolení s Prachařovou i další Talent. Prima představila podzimní program - iDNES.cz" (in Czech). Kultura.idnes.cz. 1 August 2013. Retrieved 7 September 2013. ^ "QI: Na vše máme odpověď – nová show Leoše Mareše" (in Czech). Prima-Web.com. 1 July 2013. Archived from the original on 12 September 2013. Retrieved 7 September 2013. ^ "Series A, Episode 3". QI. Season A. Episode 3. 25 September 2003. ^ "Series C, Episode 10". QI. Season C. Episode 10. 2 December 2005. ^ QI Series 2 DVD Banter, with John Lloyd, John Mitchinson and Piers Fletcher. ^ "Series B, Episode 10". QI. Season B. Episode 10. 10 December 2004. ^ a b "Descendants". QI. Season D. Episode 8. 10 November 2006. ^ "Series B, Episode 7". QI. Season B. Episode 7. 19 November 2004. ^ "Series C, Episode 12". QI. Season C. Episode 12. 16 December 2005. ^ Stephen Fry (20 October 2013). QI XL Series K: 7. Knowledge. BBC. Event occurs at 02:19 – 08:05. ^ Stephen Fry (20 October 2013). QI XL Series K: 7. Knowledge. BBC. Event occurs at 08:05 – 09:03. ^ Stephen Fry (20 October 2013). QI XL Series K: 7. Knowledge. BBC. Event occurs at 09:03 – 09:31. ^ Stephen Fry (20 October 2013). QI XL Series K: 7. Knowledge. BBC. Event occurs at 09:31 – 10:45. ^ "The Qibble Blog". QI. Retrieved 1 February 2015. ^ Wolf, Ian. "The Unbelievable Truth: Episode 4.7 - New Year's Special". British Comedy Guide. Retrieved 29 December 2009. ^ a b c d "BBC apologises for Japanese atomic bomb jokes on QI". BBC News. 22 January 2011. ^ "Stephen Fry's Japan visit cancelled over QI row". Sydney Morning Herald. 4 February 2011. ^ McCurry, Justin. "Stephen Fry shelves filming in Japan after atomic bomb jokes outcry". The Guardian. 3 February 2011. ^ "Stephen Fry Japan trip scrapped after A-bomb joke". BBC News. 3 February 2011. ^ "BBC QI show host cancels Japan trip over A-bomb survivor joke" Archived 6 February 2011 at the Wayback Machine Mainichi Shimbun. 4 February 2011. ^ Roberts, Laura; Edwards, Richard (9 February 2011). "BBC faces fresh criticism over offensive remarks about Baroness Thatcher". The Daily Telegraph. Retrieved 26 February 2015. ^ Guide, British Comedy (9 December 2011). "BBC postpone QI episode over Clarkson controversy". ^ "Was it something I said? BBC pulls QI episode featuring Jeremy Clarkson in aftermath of suicide comments". ^ Halliday, Josh (29 August 2013). "Stephen Fry paedophilia limerick on QI 'unfortunate and regrettable' - BBC". The Guardian. Retrieved 9 July 2015. ^ a b Horton, Helena (6 November 2014). "Shocking stats reveal comedy's HUGE gender gap". The Mirror. Retrieved 10 September 2018. ^ Singh, Anita (9 February 2014). "BBC bans all-male panels on comedy shows". The Telegraph. Retrieved September 10, 2018. ^ Cooke, Rachel (8 February 2014). "Danny Cohen: 'TV panel shows without women are unacceptable'". The Guardian. Retrieved September 10, 2018. ^ Bastow, Clem (11 February 2014). "Should we ban all-male comedy panels?". Daily Life. Retrieved 2018-09-10. ^ Furness, Hannah (12 October 2017). "BBC battle for female comedians on panel shows is 'tokenism', John Lloyd says". The Telegraph. Retrieved 10 September 2018. ^ Agencies (1 April 2014). "Sandi Toksvig criticises BBC ban on all-male panel shows". The Telegraph. Retrieved 10 September 2018. ^ Plunkett, John (14 October 2015). "Representation of women on TV at tipping point, says Sandi Toksvig". The Guardian. Retrieved 20 January 2019. ^ Cox, Emma (17 September 2018). "Sandi Toksvig: 'Standing as an MP? I'm not going to say no to anything'". Radio Times. Retrieved 20 January 2019. ^ "Toksvig 'paid fraction' of Fry's QI fee". BBC News. 8 September 2018. Retrieved 8 September 2018. ^ "Sandi Toksvig: I'm paid half Stephen Fry's salary to host QI". Chortle. 8 September 2018. Retrieved 9 September 2018. ^ Bird, Steve (8 September 2018). "Sandi Toksvig reveals vast QI gender pay gap". The Telegraph. Retrieved 9 September 2018. ^ Wray, Richard (3 February 2007). "QI News: QI is Amazon's Global Bestseller Worldwide". The Guardian. Archived from the original on 3 July 2007. Retrieved 29 July 2007. ^ Chapman, Peter (18 November 2005). "QI: Quite Interesting". QI News, originally The Independent. Archived from the original on 27 September 2007. Retrieved 3 August 2007. ^ Barton, Laura (26 April 2006). "QI: The last bastion of good television". QI News, originally The Guardian. Archived from the original on 27 September 2007. Retrieved 3 August 2007. ^ Schillinger, Liesl (2 September 2007). "QI gets The New York Times treatment". QI News, originally The New York Times. Archived from the original on 7 February 2012. Retrieved 13 September 2007. ^ Schillinger, Liesl (2 September 2007). "Books of Style". The New York Times. Retrieved 13 September 2007. ^ Smith, Matt (26 October 2011). "Review: QI Live with Stephen Fry | Perth, Melbourne, Brisbane". Crikey. Retrieved 7 February 2015. ^ a b c d e f "BAFTA Winners and Nominations List 2000-2005" (PDF). BAFTA. Retrieved 25 July 2007. ^ "The Comedy.co.uk Awards 2006". British Comedy Guide. Retrieved 7 March 2009. ^ talkbackThames, "Three Rose D'or wins for talkbackThames Written 1 May 2006. Retrieved 25 July 2007. ^ "The Comedy.co.uk Awards 2007". British Comedy Guide. Retrieved 7 March 2009. ^ "PAST WINNERS 2007". British Comedy Awards. Retrieved 9 February 2015. ^ Channel 4 - The 2007 Winners. Retrieved 5 July 2007. ^ a b "Programme Awards 2007: Winners". Royal Television Society. 19 March 2008. Archived from the original on 28 March 2008. Retrieved 20 March 2008. ^ a b Wolf, Ian. "QI - A Quite Interesting Guide". British Comedy Guide. Retrieved 15 May 2009. ^ "The British Comedy Awards - 2011 winners". British Comedy Awards. Retrieved 9 February 2015. ^ "Awards for 2011". ukgameshows.com. Retrieved 9 February 2015. ^ Brown, Aaron (23 January 2013). "Miranda picks up top Comedy.co.uk Awards titles". British Comedy Guide. Retrieved 21 January 2013. ^ Boosey, Mark (21 January 2013). "The Comedy.co.uk Awards 2012". British Comedy Guide. Retrieved 21 January 2013. ^ "National TV Awards 2012: The winners". BBC News. 25 January 2012. Retrieved 9 February 2015. ^ Jones, Paul (23 January 2013). "National Television Awards 2013: QI wins Best Comedy Panel Show". Radio Times. Retrieved 1 February 2015. ^ "QI: The Book of General Ignorance". Faber.co.uk. Archived from the original on 26 September 2009. Retrieved 4 August 2009. ^ a b c d Everything QI: Quite Interesting, the QI Blog. 31 January 2007. Retrieved 5 February 2008. ^ a b General Ignorance at the QI Shop Archived 9 March 2008 at the Wayback Machine. Retrieved 5 February 2008. ^ a b c Wolf, Ian. "QI Merchandise". British Comedy Guide. Retrieved 25 July 2008. ^ "QI: The Book of Animal Ignorance". Faber.co.uk. Archived from the original on 21 December 2008. Retrieved 4 August 2009. ^ a b Animal Ignorance at the QI Shop Archived 21 January 2008 at the Wayback Machine Retrieved 5 February 2008. ^ "The QI Pocket Book of Animals: Amazon.co.uk: QI, John Mitchinson, John Lloyd: Books". Amazon.co.uk. Retrieved 16 March 2010. ^ "QI: The Book of the Dead: Amazon.co.uk: John Mitchinson, John Lloyd: Books". Amazon.co.uk. Retrieved 16 March 2010. ^ "QI: The Second Book of General Ignorance: Amazon.co.uk: John Lloyd, John Mitchinson: Books". Amazon.co.uk. Retrieved 24 January 2011. ^ "1,227 QI Facts To Blow Your Socks Off (Book)". British Comedy Guide. Retrieved 29 October 2012. ^ "The QI Annual 2008". Faber and Faber. Archived from the original on 24 November 2009. Retrieved 4 August 2009. ^ "Les autruches ne mettent pas la tête dans le sable: 200 bonnes raisons de renoncer à nos certitudes". Dunod.com. Archived from the original on 1 May 2008. Retrieved 15 February 2008. ^ Grimes, William (30 November 2007). "Reading Fun Before Frosty Melts Away, and After". New York Times. Retrieved 4 February 2008. ^ New York Times "Hardcover Advice" Best-seller chart, 12/09/2007. Retrieved 4 February 2008. ^ New York Times "Hardcover Advice" Best-seller chart, 01/20/2008. Retrieved 4 February 2008. ^ QI Talk Blog - The second interactive QI DVD Created 10 May 2007. Retrieved 15 June 2007. ^ "Pester power: QI fans force DVD release". Chortle.co.uk. 19 October 2006. Retrieved 12 December 2007. ^ a b c "QI : Complete BBC Series 1 2003 (DVD)". amazon.co.uk. Retrieved 4 May 2014. ^ a b c "QI: The B Series DVD 2008". amazon.co.uk. Retrieved 4 May 2014. ^ a b QI Talk Blog - QI Series B on DVD Created 4 July 2007. Retrieved 4 July 2007. ^ a b "Qi - the C Series Series 3 DVD 2008". amazon.co.uk. Retrieved 4 May 2014. ^ "Watch QI". qi.com. Archived from the original on 1 January 2016. Retrieved 3 January 2016. ^ "2016 Announcement". networkonair.com. 14 December 2015. Archived from the original on 3 January 2016. Retrieved 3 January 2016. ^ a b "Qi: The Complete Series 1-3 (6 Disc)". Roadshow Entertainment. Archived from the original on 23 May 2014. Retrieved 22 May 2014. ^ a b "Qi - The Best Bits DVD". comedy.co.uk. Retrieved 22 January 2013. ^ a b "QI Series 9". Roadshow Entertainment. Archived from the original on 17 March 2014. Retrieved 22 May 2014. ^ a b "QI - The H Series". JB Hi-Fi. Retrieved 2 February 2015. ^ a b "QI, The J Series". Roadshow Entertainment. Archived from the original on 8 December 2013. Retrieved 22 May 2014. ^ "QI: Series A-D (Box Set) DVD". zoom.co.uk. Retrieved 30 July 2017. ^ Williams, Garry (4 September 2011). "Quiz Show". Sunday Herald Sun. p. 16. ^ "QI: Series E-G (Box Set) DVD". zoom.co.uk. Retrieved 30 July 2017. ^ "QI - The Best Bits". Roadshow Entertainment. Archived from the original on 23 May 2014. Retrieved 22 May 2014. ^ "QI: Series H-J (Box Set) DVD". zoom.co.uk. Retrieved 21 May 2018. ^ "QI: Series K-M (Box Set) DVD". zoom.co.uk. Retrieved 21 May 2018. ^ "QI Xl QI 2008-2013". netflix.com. Retrieved 4 June 2015. ^ "QI Series 12". Amazon Video. Retrieved 9 June 2018. ^ "QI". UKTV Play. Retrieved 10 March 2017. ^ "QI United States". RLJ Entertainment. Retrieved 13 January 2017. ^ "QI on Hulu". Hulu. Archived from the original on 5 May 2014. Retrieved 5 May 2014. ^ "Win a holiday to Japan". The Daily Telegraph. London. ^ a b "QI News". glennwrage.com. Archived from the original on 2 April 2015. Retrieved 1 February 2015. ^ "QI: A Quite Interesting App for the iPhone". Faber and Faber. 27 December 2010. ^ "The QI App". QI. Archived from the original on 27 December 2010. Retrieved 27 December 2010. ^ "QI plans daytime spin-off". Chortle.co.uk. 3 October 2008. Retrieved 3 October 2008. Quite Interesting Ltd. official website. QI home page at The Telegraph.